NASA engineers want to squeeze as much power as possible from the wing-like solar arrays on the International Space Station, and the agency has launched a software contest to make it happen, officials announced today (Jan. 17). The space agency is sponsoring a $30,000 competition to optimize the position of the station's eight solar arrays during certain parts of its orbit using a software algorithm. The goal is to maximize power output and minimize shadowing of longerons, the long arms holding the arrays to the station, which are sensitive to temperature changes. With more power at hand, astronauts aboard the $100 billion orbiting lab can perform more experiments, increasing the station's scientific returns, contest organizers said. The grand prize for the best software algorithm will win its creator $10,000, while second and third place are worth $5,000 and $3,000, respectively. The top 10 entries will all receive cash, and prizes for certain milestones bring the total purse to $30,000. The top five finishers will also receive mission stickers that orbited Earth aboard the space shuttle Endeavour. The contest — officially called the ISS Longeron Shadowing Optimization Challenge — is run through the NASA Tournament Lab, a joint effort of the space agency, Harvard University and the digital-creator community TopCoder. The International Space Station is powered by eight solar arrays, arranged in pairs of wings, which extend from a central backbone-like truss structure. Each pair of solar arrays is 39 feet (11.8 meters) wide and has a wingspan of nearly 240 feet (73 m). When combined with the station's Russian solar arrays, the outpost's power system generates about 110 kilowatts — enough electricity to power 55 houses, NASA has said. "These are the types of complex low-risk, high-reward problems that get our community of creators excited," Rob Hughes, president and chief operating officer of TopCoder, Inc., said in a statement. "The solutions brought forth for this problem can move the needle for NASA and provide a roadmap for other agencies to tackle stubborn challenges." 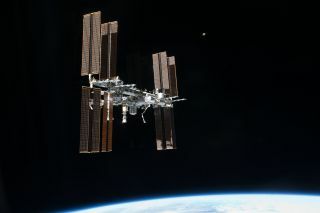 Assembly of the International Space Station began in 1998, and the orbiting outpost has been continuously occupied by astronauts since November 2000. The station weighs more than 400 tons and spans the area of a football field. It has about as much livable space as a five-bedroom house, or the cabin of a 747 jumbo jet. For more information about the contest, and to learn how to participate, visit www.topcoder.com/iss.